The Appleton, Wisconsin newspaper, the Post-Crescent, ran the announcement shown below in today's paper (Sunday, Sept. 19, 2004). No wonder missionary work is so difficult out here. How can the Mormons compete? I've written Salt Lake and asked for some polka-trained missionaries to be sent, but the most polka-fluent elders tend to go to Ghana. Go figure. And even if we get the polka expertise we need, I don't think we'll ever get permission to do a polka mass of our own or to even offer a healthy, low-cost breakfast at our Sunday services. It's just not fair. Plus the Brethren probably won't go for the Jerry Schneider band during Sacrament meeting. Who can compete against that? We are looking into serving decaffeinated coffee or at least a coffee substitute made from charred home-storage wheat (after 15 years in a Mormon basement, it's been "aged to perfection" and ready to brew). Not sure if this will fly with Salt Lake, but when you're head-to-head against polka bands in the battle for souls, we've got to think outside the box. Also, instead of polka music, how about a bagpipe band? Imagine all the converts we'd get with that! 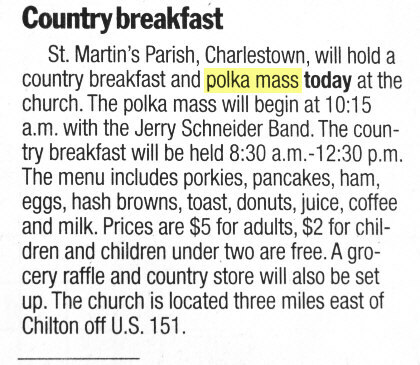 Forget about the polka; it'd be nice if we could just get an announcement that we exist and when our church services are, in the paper. My current ward is about ten times bigger than the rural branch we were in before (in a town where Jews, Mormons, AND Jehovah's Witnesses had to travel outside the city limits -- in one case, to Cleveland -- to go to church/synagogue); most of the people here still don't even know we exist, except as fanciful nightmares from an anti book or pastor. Since children under two are free, can I order three, please? I'm just trying to decide which hymns would be best for the accordion. Whatever a 'porkie' is, it sure sounds nutritiious and delicious. Okay... So today was going really bad and I've been praying for a new attitude and for good thoughts, etc. and then the Holy Ghost reminds me I haven't checked Jeff's blog today... so I check, and laugh for about 5 minutes. Thanks! I needed that! I think we should try a 'Stomp' meeting though... I think President Hinkley would go for that... well, maybe not... (for those who don't know what that is, it involves trash can lids, cans, pots, pans, shovels and anything else that can make really loud noises that are not normally considered instruments. Also, everyone STOMPS really loud in clunky shoes. Hence the name...) Anyhoo... just a thought. I think we all need to quit whining. I don't think our problem has anything to do with not being able to worship in "polka" or even that we can't drink caffeinated coffee (which I thought had been approved). Midwesterners don't trust us period. They never have (check our Mormon history) and probably never will. I think we need to quit whining and go love our neighbors. If we had the guts to try holding a Polka service one weekend, I bet nobody new would show anyway. These people trust the Bible and not the book of Mormon. We trust the Bible too don't we? If we used it more and let others get to know it more slowly who knows what could happen? Am I being too blunt?